I’ll be the first to make that sacrilege admission amongst photographers: I don’t need a viewfinder on my camera. Perhaps this is because I am a pure product of the smartphone generation, or because my eyesight still serves me relatively well. Either way, holding my camera out in front of me in a pose which Kirt Tuck so eloquently calls the “stinky baby diaper hold” doesn’t make me feel like any less of a photographer. In truth, some of my best shots have been taken with my arms stretched out, full-length, with only an LCD screen to serve as guidance. 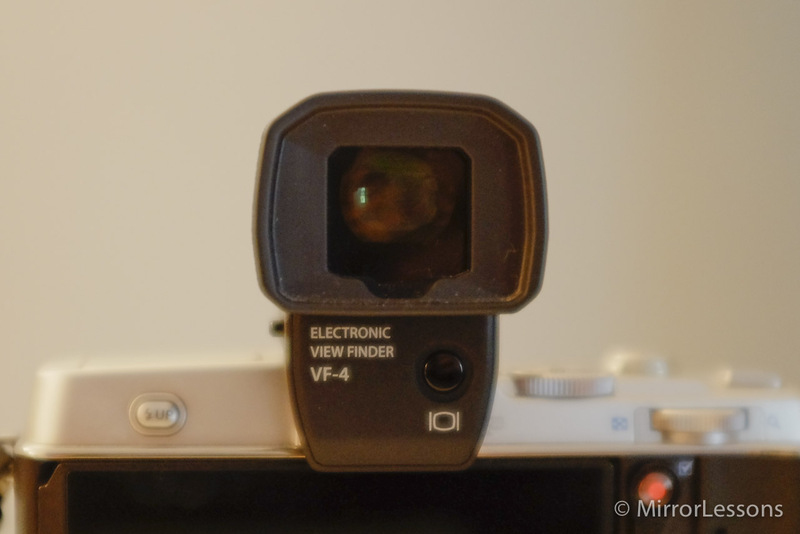 This doesn’t mean I am against viewfinders – far from it, in fact. My point is that I am just as happy to use one or the other, depending on my mood. 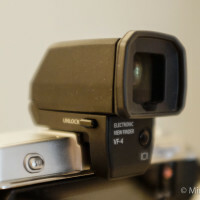 Now that skeleton is out of the closet, we can turn to the Olympus Electronic Viewfinder VF-4. I originally bought the Pen E-P5 sans viewfinder as it was the only version in stock, so I spent a good week exclusively using the LCD screen while I waited for the VF-4 shipment to come in. Thanks to the LCD’s stunning 1,037k-dot resolution and tilting feature, I had no trouble using the Pen E-P5 in its raw form while I waited. When the VF-4 did arrive, I was pleasantly surprised at how sturdy yet light it felt. It locked onto my E-P5’s hotshoe like a glove to a hand, making the chances of it slipping off the camera are slim to none. However, I am still careful about exposing the VF to too many knocks and bangs. A light blow wouldn’t phase it, but a hard knock against the floor or wall might just dislodge it or cause some serious damage. Furthermore, it has a cushy rubber eyepiece which is comfortable even for those who wear glasses. The VF-4 before attaching it to the E-P5. 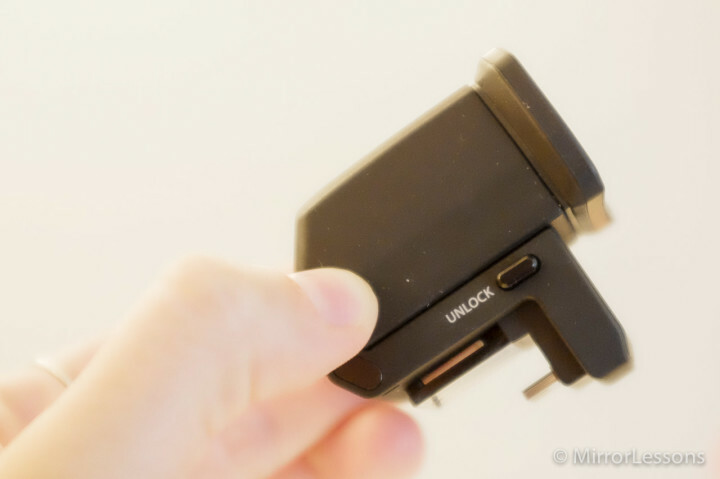 On the right side, there is a rectangular Unlock button which, when pressed, allows you to unlatch the viewfinder from the camera. The viewfinder articulates 90 degrees upward, which is great news for those who aim for stealth and discretion on the streets. (Just think of how Vivian Maier used to shoot.) It is also helpful for ground level shooting and awkward spaces. On the left side, you have a large diopter adjustment dial which is as stiff as a bottle cap to turn when you need it. Of course, this was done on purpose, as you wouldn’t want the dial to accidentally rotate in your camera bag. It ranges from -4 to +2, and serves very well for those who have eyesight problems. The large diopter adjustment dial. Stiff, but indisputably useful. 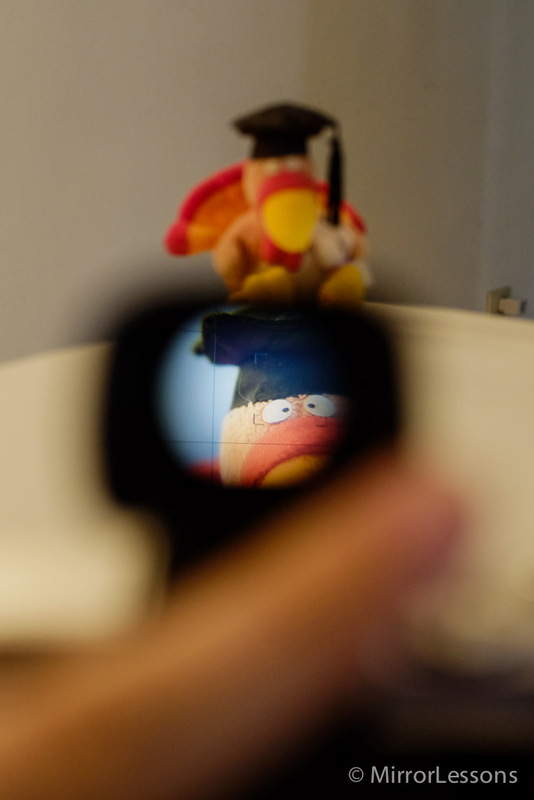 Now, we move onto the most important part: the image quality of the viewfinder. Well, PCMag didn’t call it “the best EVF that we’ve seen for digital cameras” for nothing. The image quality of the VF-4 is spectacular. The refresh rate is extremely quick (even in difficult light conditions), and with 2.36 million dot resolution, the image is tack sharp and the colours are pleasant and realistic. In low-light, you will find that brightness is exaggerated through the viewfinder, but this can be overcome by keeping an eye on the exposure compensation meter. All overlay information about your camera settings is also displayed in the viewfinder. 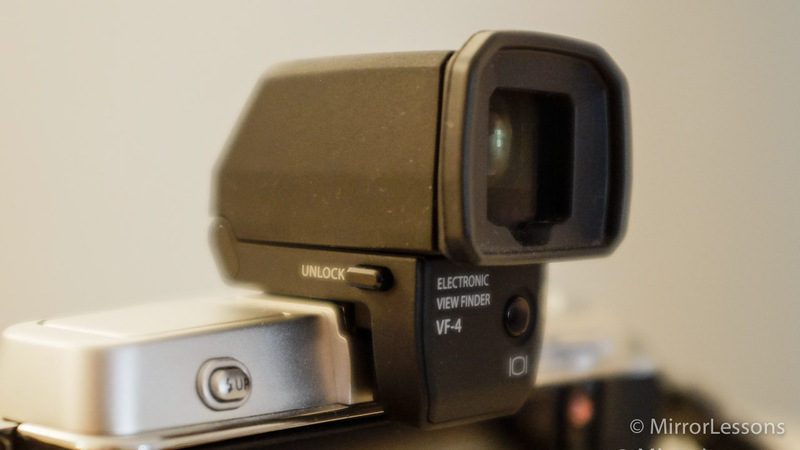 Being an electronic viewfinder, you obviously cannot expect the image quality you’d receive with an optical viewfinder, but with the VF-4, Olympus has moved one step closer to capturing reality in a virtual format. This, coupled with the 1.48x magnified field of view, makes it one heck of an accessory. This viewfinder oozes with high image quality. So, as a photographer who is indifferent to viewfinders, how much do I find myself using the VF-4? I would say that I feel encouraged to use it 60% of the time I am out shooting, mostly for portraits and action shots. Sometimes, I will end up taking the same shot, once with the LCD and a second time with the viewfinder. I can definitely say that I feel more comfortable knowing that it is there for situations in which the LCD isn’t ideal. One aspect that bothers me about the VF-4 is how it protrudes so significantly from the compact body of the Pen. In total, it is probably a good 3.5 cm in height. When I am out shooting, its protruding nature is actually a blessing as it stops the Pen’s sensitive touch screen from banging against my stomach as I walk, subsequently changing the camera settings against my will. However, when I want to place it in a compartment of my camera bag, I have to remove the VF first to get the camera to fit. Sometimes I merge two compartments of my bag into one large compartment before leaving the house, but this can grow to be a nuisance, especially if I want to bring out more than two lenses at a time. 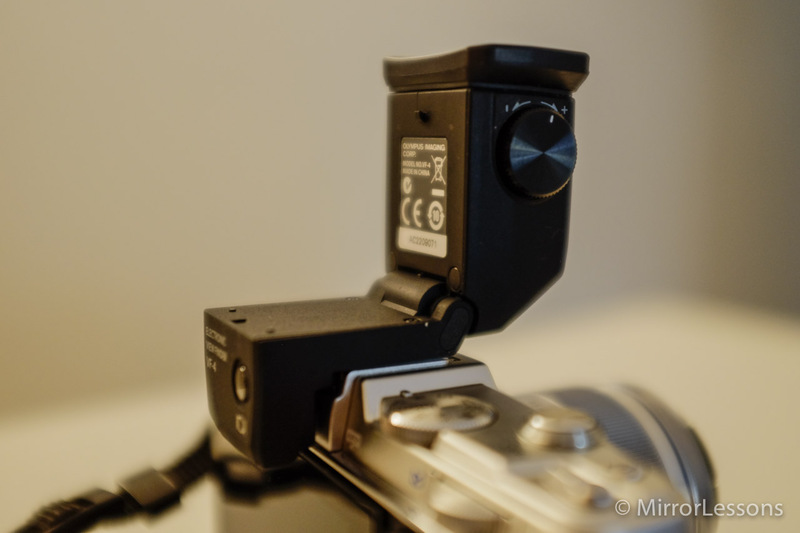 Another aspect is that the peak highlight for manual focusing is less effective with the viewfinder. This is because it is slower and tends to be “jumpy”. Nothing dramatic here but if you use both the LCD and EVF for manual focusing, you will notice a difference. 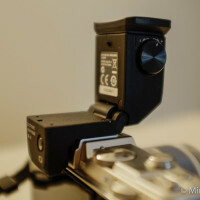 Another thing owners of previous Pen models should aware of before buying the VF-4 is that the viewfinder will only be compatible with a firmware update. Moreover, the eye sensor will not automatically switch between the VF and the LCD screen as it does with the E-P5. 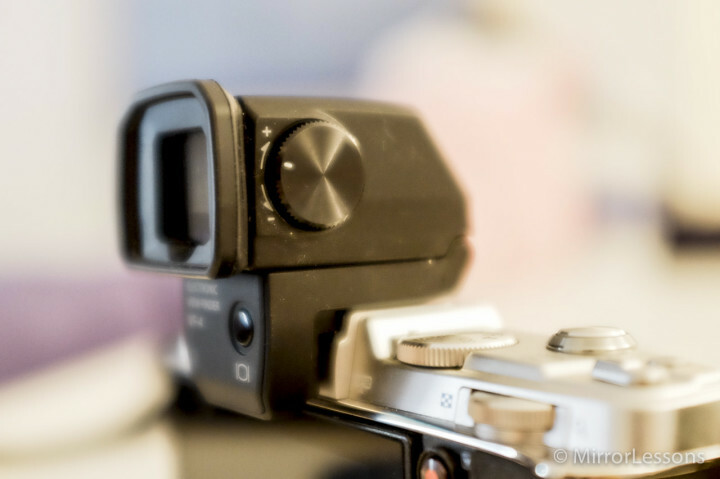 To switch to one or the other, you will have to press the dedicated button on the viewfinder. Finally, the refresh rate and image quality may not be as good on older Pen models, particularly the first models in the series. The eye sensor has activated the viewfinder. Check out that clear image! 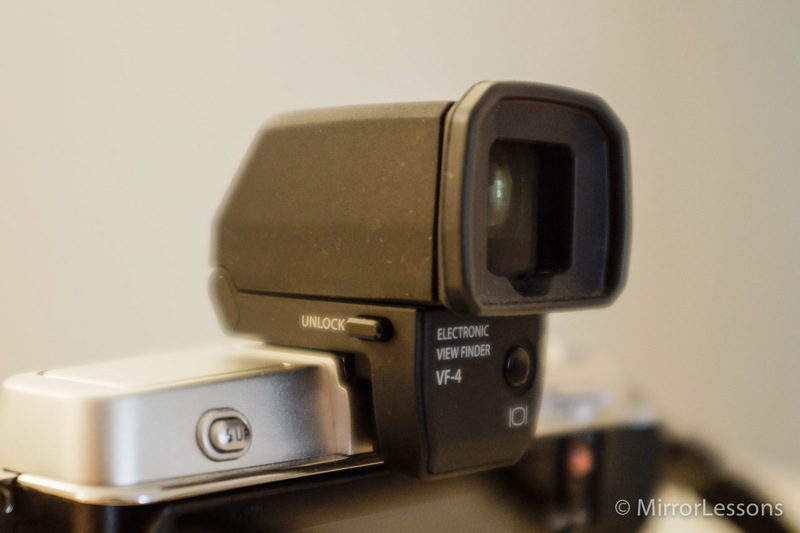 My verdict is that the Olympus VF-4 Viewfinder is one fine piece of equipment. If you cannot live without a viewfinder on your camera, there should be no doubt about purchasing the VF-4 with the E-P5 kit, or using it with another Pen. If you are generally unconcerned, like me, you will have to consider value for money. Ask yourself: How much will I actually use the viewfinder? Will it improve my shooting experience? I personally feel that the Pen E-P5 is just as enjoyable to use without, but mine is just one opinion in a sea of many!